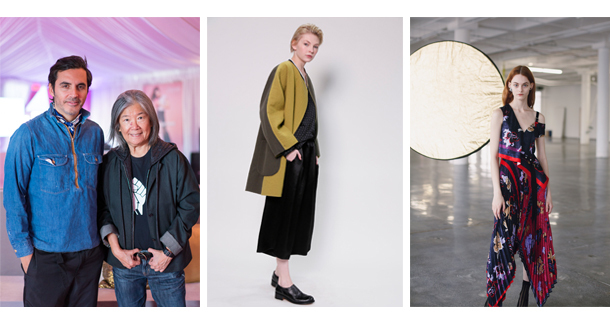 Charleston Fashion Week is in full swing, with Featured Designers Yeohlee Teng (tonight) and Yigal Azrouël (Saturday) taking the stage. Teng, a New York designer from Malaysia, has been dressing the “Urban Nomad” since 1981, and is now known for minimalist women’s wear that blurs the lines of gender, size, and shape. Azrouël, also a New Yorker, grew up in Israel, and has spent the last 20 years striking the perfect balance between hard and soft, while always appearing “effortlessly chic.” We sat down with the designers to chat about their fall collections, personal processes, what inspires them, and how they strive to empower women through fashion. CM: What can we expect to see from you on the runway? Azrouël: I’m celebrating 20 years in fashion this fall, so I’ve been looking back through my archives to see what pieces I’ve done in the past and kind of deconstructing them or using them as references. Architecture was a big inspiration for me, and I like things that are more minimal but have something interesting as far as texture and layers. Teng: The inspiration was ninjas and samurais, and it’s a cultural melange of influences. It’s beyond “east meets west”—it’s most like the world of today. And it’s very New York. CM: Is there anything that sets this collection apart from what you’ve done in the past? Azrouël: I’m always evolving, but I try to think about what inspires me the most: women. In every collection I do, I think about why I’m doing it: the idea of empowering women and making clothes that make them look and feel good. Anything you wear will change something in you—it all has an energy. And every woman has her own beauty. Every woman could wear the same thing, but each would look different. So it really depends on where she wants to take it. CM: Yeohlee, back in the ’90s you said you made clothes to dress the “Urban Nomad.” Have you seen that idea change at all over the 20 years since you coined the term? Teng: If anything, it’s become more true. Originally I had a studio on 5th Avenue and 20th Street, and I’d always look out the window and see people of all stripes carrying some kind of bag or other. I started thinking of humans being like yak-herders, always carrying things, going here and there, and it became more sophisticated when I started thinking of all my clients. If you had to get on a plane in New York, and when you disembarked you had to go straight to a meeting, what would you wear? So I design for the Urban Nomad. For example, I traveled in this, and now I’m at my interview. It’s about versatility and appropriateness. CM: What are you most looking forward to during your stay in Charleston? Azrouël: This is my first time in Charleston. I haven’t seen much yet, but I grew up on the beach and I am very interested in going to the beach while I’m here. I’ve been surfing all my life, so I’m hoping to go check out the waves. Teng: I love the food. I am about to try my first she crab soup. I was told that 82 Queen is the place to go. For more on Yeohlee Teng, click here. For more on Yigal Azrouël, click here. For tickets and information for CFW’s Saturday runway shows, click here.